I love making crêpes because they are great for filling with savory ingredients for a meal or sweet ingredients for a dessert. Plus you can make the batter ahead of time or the crêpes. The filling being used is a savory combination of sage sausage and buttercup squash. Serves 8 – 10 depending on how much filling you put in the crêpes. Cut squash in half and remove seeds and pulp. Place squash flesh side down in a roasting pan or cake pan and add enough water that a quarter of the squash is covered. Cover with foil and bake at 375 degrees for about 1 hour or until fork tender. Let cool, slightly. Be careful when removing the foil, the steam is hot. Gently remove squash and scoop the flesh out of the squash and set aside. Make crêpe batter by dumping all ingredients into a blender and blend until smooth. Set aside and make filling. The batter can be made a couple of hours ahead and refrigerated until ready to use as I had done. Just give it a quick pulse in the blender before making the crêpes. The batter can be made a day ahead of time and refrigerated and/or the crêpes can be made ahead of time and refrigerated for up to 2 days or frozen for up to 1 month. In a large skillet add olive oil sausage and onion and sauté over medium high heat, breaking up sausage as you cook it. One cooked, add squash and add kosher salt and pepper to taste. Cover and set aside. Make crêpes, by spraying a crêpe pan or a small non-stick skillet and preheating it over medium high heat. You should be able to feel the heat when you hover your hand over the pan. At this point add about a 1/4 cup of batter and swirl around the pan to cover it. Flip about 30 seconds after adding batter and cook on second side for another 30 seconds. If needed peak under the crêpe to see if it has a golden color. The best tool to use is a fish turner, but use what you have on hand. As an FYI, a crêpe turner is not your best tool. Generally the first couple of crêpes you will have to throw out. Place on a plate or platter and continue with remaining crêpes. The batter yielded about 12 crêpe and this will vary depending on how many you have to throw out. 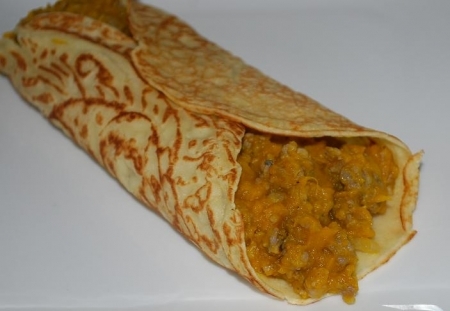 Once you have completed making the crêpes, assemble them by adding a crêpe to a plate and fill the center of the crêpe with the filling mixture, about 1/2 of a cup. Make sure mixture is warm before assembly. Heat it up if it has cooled too much. Fold crêpes as shown, continue with the reaming crêpes and serve immediately. Try J. Lohr Arroyo Seco Riverstone Chardonnay (California), Franciscan Chardonnay Vintage 2006 (Napa Valley, California), Bogle Vineyards Pinot Noir (Russian River Valley), Parducci Family Farmed Pinot Noir (California), orange juice, lemonade or an iced tea.